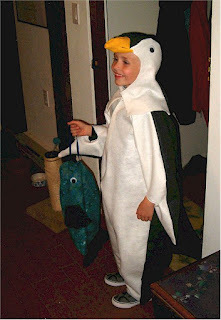 For Halloween 2007, Sam was a penquin, complete with a "fish" candy bag. Sam is a big fan of Disney's Happy Feet and has been driving me insane for several months now with sudo-tap dancing outbursts in stores, banks, at school, and in the middle of the street. I figured channelling this energy was a good idea. I think Sam enjoyed it, although the pattern called for self-sticking Velcro, which continually separated from the fabric, so we spent the night him waddling dramatically door to door with me sticking him back together in between. I had the unique pleasure of being contacted by a casting agent (out of the blue) for a part reading in the upcoming movie Swing Vote, and was selected as "Butch Gay Cop". For more information about the movie, please visit Internet Movie Database at http://imdb.com/title/tt1027862/ . We had one day of filming. My part is basically a female NY police officer in support of the republican incumbant President's (Kelsey Grammer) promised "open door policy" if he is re-elected. I will be in the President's television ad announcing this campaign promise. It should be said, the movie is a comedy, and I'll be on screen perhaps a total of 3 seconds, but I had a great time. The people I worked with on the set were all really fun and wonderful. My costume was labeled inside as "Will Farrell - SNL" which I thought was just cool, but even cooler was the paycheck - as this was a speaking roll, I now qualify for a Screen Actors Guild membership, and get paid at the union rate. I received my SAG invitation in the mail yesterday. I'll register if/when I ever have another roll. 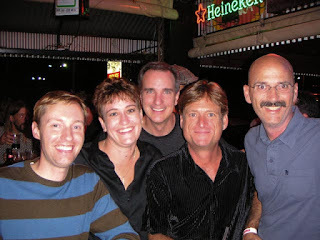 Once the movie filming wrapped, I was invited to the wrap party. Most everyone I worked with attended. I also briefly met Kevin Costner. It was great to get together with everyone again and get to know them better. John took the above picture of me and "the boys" - left to right, Brent, myself, Scott, Rob (a professional Liberace impersonator) and Preston. Since the wrap party, we have also attended Rob's Birthday/Halloween party. John and I have really had a lot of fun with our new friends!